Yesterday I happened to see a reference to the fact that Christmas is only 152 days away and I suddenly lost my bearings. Although it’s not hard to imagine the trays of cookies, the scent of pine and a chill in the air, I like to stay firmly planted in the present. And, as I review my calendar for August, I realize another interesting moment is approaching, the 6th year anniversary of this blog. Yikes! While it’s true that most bloggers routinely hit a wall after two years, my intentions are still very much in tact. So I just keep going week after week, fashioning the cream and the crumb. I still love working and learning in my lab season after season, each with its own mood, sights and scents. For example, there’s this moment in the summertime when you walk into the kitchen and the intoxicating aroma of ripened peaches washes over you like the best perfume. Their skins are dark red and they give just a bit to the touch. They’re ready. It’s my impression that the fruit in my region has been very good this year. I only ran into a couple of mealy apricots but the rest of my purchases have been really stellar. And so it is with these peaches. They were beautifully ripe and I thought I’d use them to substitute in Thomas Keller’s Apple Cake from The French Laundry Cookbook. The recipe is a pretty basic cake formula with fresh fruit slices pushed into the surface. When you cut into it, the orange red sunset hues of the peaches are revealed. 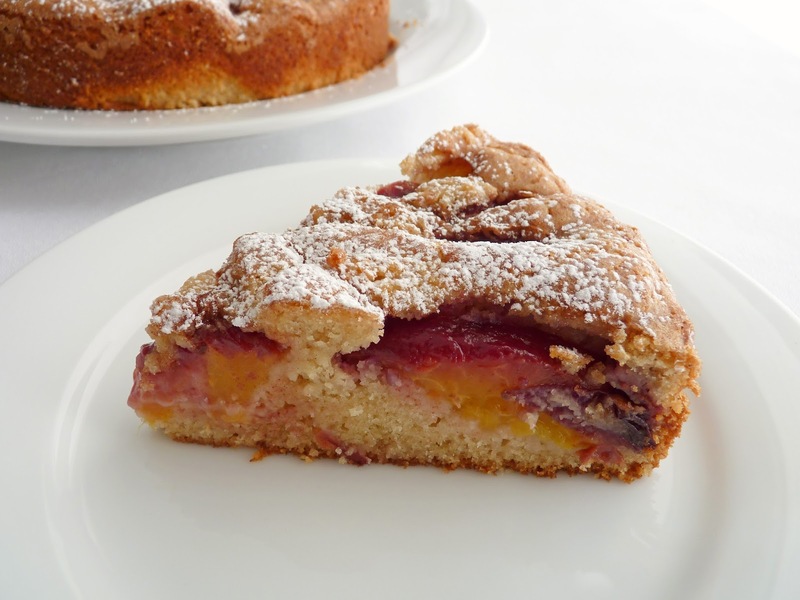 An easy cake for summer, the fruit bakes into a warm luscious texture. So my advice for the day is to seize the moment. Before we head toward Christmas once again, pick up some peaches and immerse yourself in the joys of summer!! - Peaches should be ripe but not overripe or the cake will be soggy. - I added 1 teaspoon of vanilla along with the milk. - The recipe calls for baking the cake for 40 – 50 minutes but mine was done in just about 40 minutes, so check it on the early side. - This cake would be nice served with a dollop of whipped cream flavored with almond extract or Amaretto. 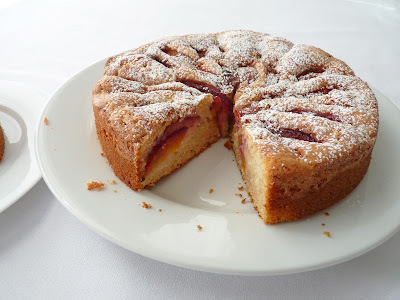 - Keller’s recipe is an apple and cranberry cake served with a sweetened butter and cream sauce. Preheat oven to 350 degrees. Lightly grease a 9" cake pan and line the bottom with a circle of parchment paper. Cut the peaches in half and remove the pit. Cut into 1/2” slices and set aside. Sift the flour, baking powder, salt and nutmeg. Cream the butter and sugar until the mixture is light and fluffy. Add the egg and combine thoroughly. Scrape down the bowl. Add the flour mixture in thirds, alternating with half the milk, beginning and ending with flour. Spread the batter in the prepared pan. Press the peach slices into the batter, skin side up, working around the pan in a circular pattern and leaving a little less than 1/2” above the batter. Combine the 3 tablespoons sugar with the cinnamon and sprinkle evenly on the surface of the cake. Bake until golden and a toothpick inserted in the center comes out clean, about 38 – 42 minutes. Place on a wire rack to cool for ten minutes. 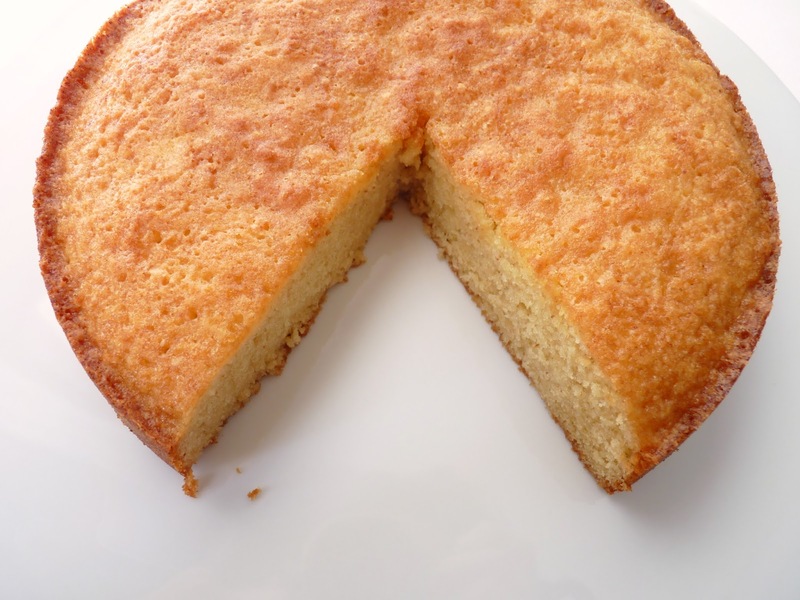 Run a thin bladed knife around the edge of the cake to loosen, then invert. Peel off the parchment and invert again. Cool. If you love the light airiness of mousse and the creaminess of ice cream, then you’ll love the combination of the two, the Italian semifreddo. It’s one of those desserts that doesn't require much effort to prepare and makes a nice presentation for a crowd. We appear to be deep into a summer heat wave across much of the nation and reaching out in search of something cold to refresh is the order of the day. 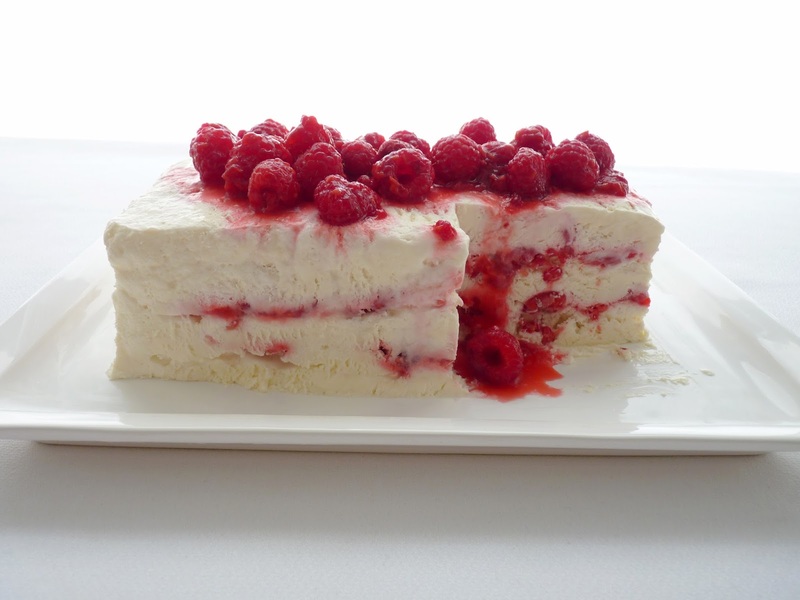 Ice cream fills the bill beautifully but if you don’t have an ice cream maker, an Italian semifreddo scented with vanilla and rippled with crushed and sugared raspberries is a great way to cool down. The base for this semifreddo is cream cheese with whipped egg whites and whipped cream folded in for more volume. 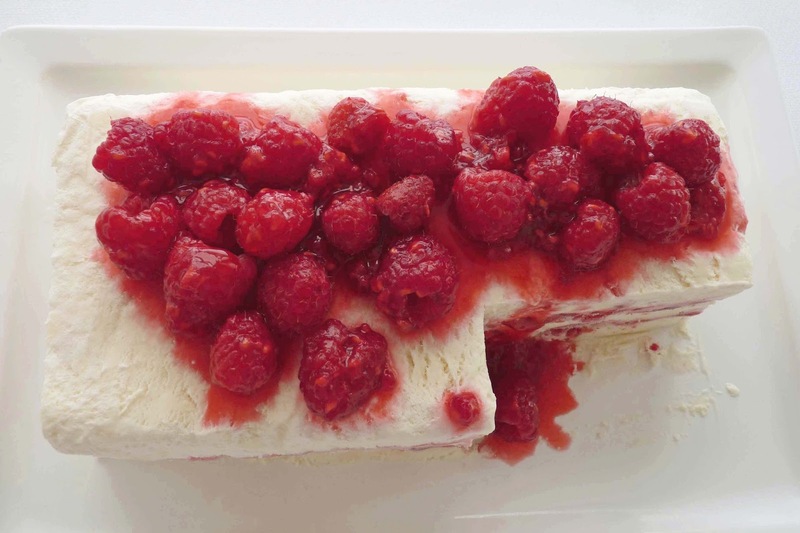 Vanilla is the base flavor and fresh raspberries give it a bright edge of tartness and color. 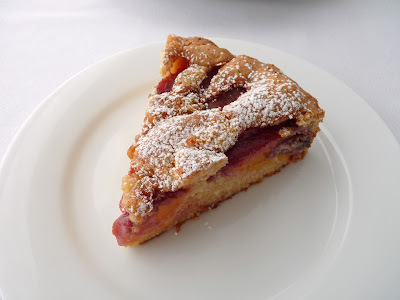 If you’ve been reading my blog for any length of time, you know I usually favor pastries and desserts that have both flavor and simplicity in equal measure. A bit of challenge is always important but I think for the most part, people tend to like unfussy preparations and simple presentations and I usually find myself striving to find this balance. I think this semifreddo is a perfect example. -When lining the loaf pan, place a strip of parchment on top of the plastic to create a smoother surface. If you don’t have parchment, once you've unmolded it, you can use a warm knife or metal spatula to smooth the creases. - The more you handle heavy cream after it’s been whipped, the stiffer it becomes. So whip the cream just until soft peaks form. This means the cream should have a soft lilt that is droopy. If you go too far, the cream will be grainy and worsen as you fold it into the other ingredients. - The meringue should be beaten to a stiff peak, which means it should stand up firmly without falling over. - The 1/4 cup sugar used with the raspberries in the semifreddo seems sweet but it helps to prevent the fruit from becoming too icy when frozen. 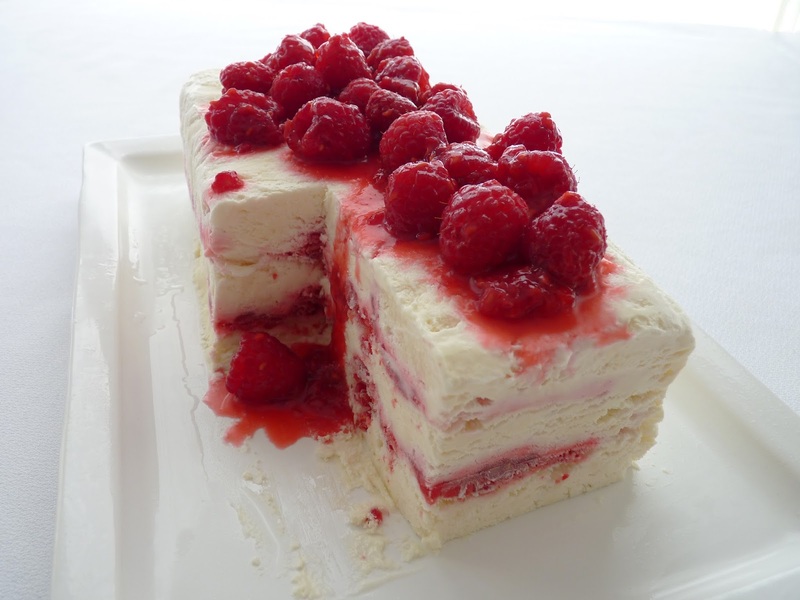 - Rather than layering the raspberries, swirl them in for a different effect. - Strain out the raspberry seeds if you prefer. - Another very easy and delicious dessert is Pistachio Semifreddo. Line an 8 1/2” x 4 1/2” loaf pan with plastic wrap, leaving a 4” long overhang on each side. You can also place a strip of parchment paper on top of the plastic to help form a smoother finish. 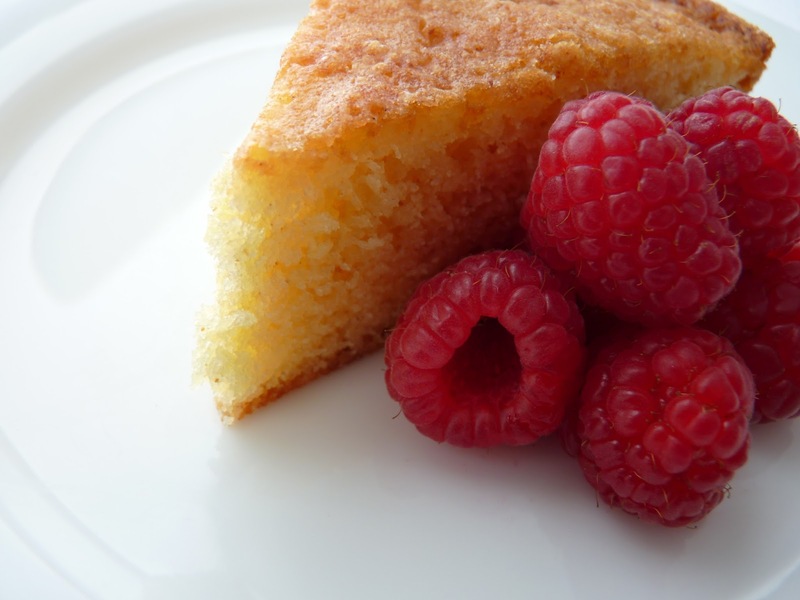 Place two-thirds of the raspberries (9 oz) in a bowl with 1/4 cup of sugar and mash coarsely with a fork. Set aside. Beat the cream cheese with 2 tablespoons of sugar and 1/4 teaspoon vanilla until smooth. Set aside. Whip the egg whites with a small pinch of salt until they are opaque and hold soft peaks. Slowly add 1/4 cup sugar a little bit at a time, increasing speed to high. Beat until meringue holds stiff, glossy peaks. Set aside. Whip the chilled cream with 2 tablespoons of sugar and 1/2 teaspoon vanilla just until it holds soft peaks. Using a rubber spatula, gently fold the meringue into the whipped cream. Then fold this into the cream cheese mixture until smooth. Pour a third into the prepared loaf pan, then add a layer of half the raspberries. Repeat the process and end with the cream mixture. Smooth and level out the surface. Cover the top with the parchment (if using) and overhanging plastic wrap and place in your freezer until firm, about 6 – 8 hours or overnight. To serve, combine the remaining 3 oz raspberries with sugar, to taste. Run a thin knife or small metal spatula around the edges of the loaf pan to loosen. Unwrap the plastic and parchment (if using) from around the top of the pan. Place a serving plate on top of the pan and invert. Pull off the pan and carefully peel off the wrapping. 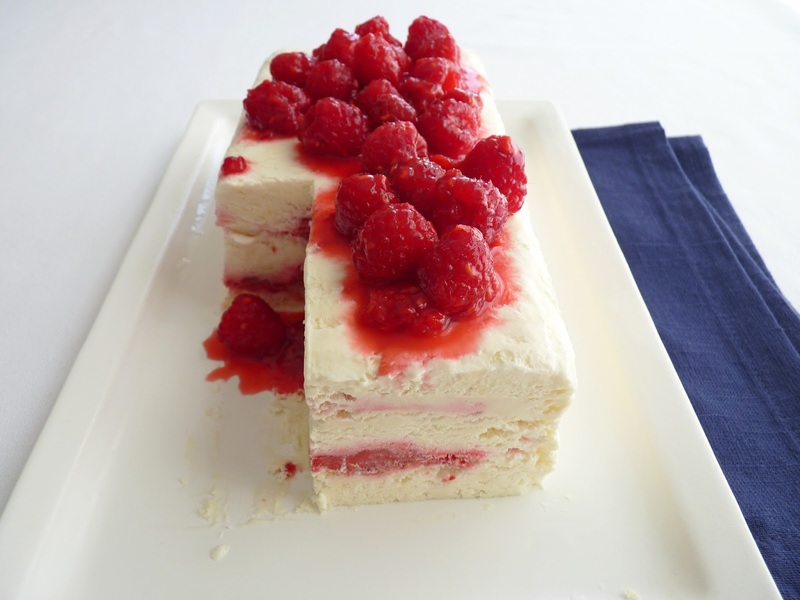 Cut into slices and serve immediately with the extra raspberries. I feel like I struck it rich a few days ago when my market had cherries, apricots, peaches, plums, nectarines, all sorts of berries and figs all at once. What a goldmine! 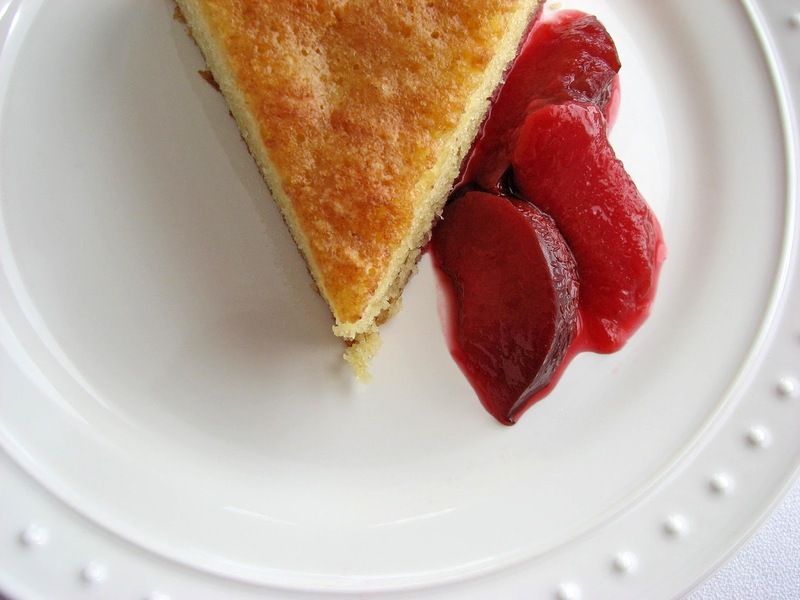 So I’m back to basics with this very versatile Brown Butter Almond Cake, a perfect partner for all the season’s colorful fruit. I tend to like these kinds of simple cakes because they can also be employed with other elements to compose another dessert, like a parfait or trifle. Even if you’re not a fruit lover, you can cover this cake with chocolate glaze or serve it with your favorite ice cream. The recipe starts with browned butter, which I use to enhance and underscore the central almond flavor. It has a good portion of almond paste so it has plenty of nutty taste. The almond paste is finely ground with sugar so it will blend well with the other ingredients. The cake is easily whisked together in a bowl and it bakes in just about 30 minutes. The next time you’re lucky enough to have some of this season's wonderful fresh fruit in your kitchen, make a little compote of your favorite one and serve it with a slice of this moist and flavorful cake. - For a good illustration of how to brown butter, see the guidance at Simply Recipes. Use a stainless steel pan so you can keep a close eye on the browning. Once you begin to detect a nutty aroma, it’s just about ready. I lift the pan off the heat and swirl for more control if I think it’s browning too fast or nearly done. It will continue to brown once you take it off the heat. Pour immediately into a heatproof bowl to stop the cooking. - For the best cake texture, it's important to process the almond paste with the sugar until it's very finely ground and looks homogeneous with the sugar. If you don't have a food processor, you can do this with a mixer but it will take several minutes. - Note 7/18/13: Reader Jen informs me that she used an immersion blender with great success to break up the almond paste with the sugar. Great idea! - I like Odense brand almond paste. This recipe calls for 3 1/2 oz or half a log. You can wrap the other half in plastic wrap, place in a zipped plastic bag and store in the refrigerator. 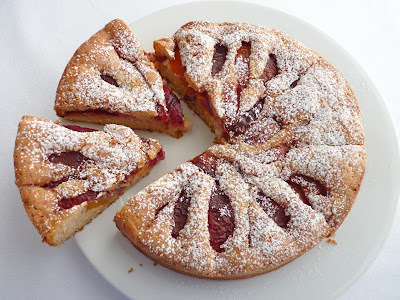 - I use all-purpose flour for this cake. - Add some lemon or orange zest or a pinch of spice for an alternative flavor. Preheat oven to 350 degrees. Lightly grease an 8” cake pan and line the bottom with parchment paper. Brown the butter to a medium dark amber and pour immediately into a heatproof bowl to stop the cooking and to cool. 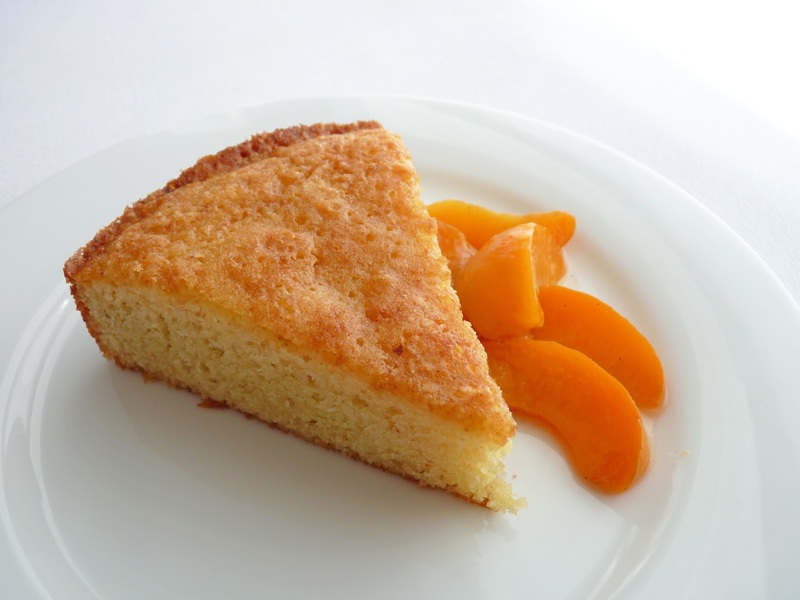 Cut the almond paste into thin slices and place in the bowl of a food processor along with the sugar. Process until the paste is broken into fine granules and blended with the sugar. Pour this mixture into a mixing bowl and blend with the cooled browned butter. Add the eggs and combine thoroughly. Mix in the vanilla. Stir in the flour until there are no streaks. Pour the batter into the prepared pan and smooth the surface evenly. Bake until a tester inserted in the center comes out clean, about 30 minutes. It’s hard to believe we're already into July but with the sun shining bright and the temperature gauge rising, it definitely feels like we are hitting our summer stride. It's a season of long days and a chance to enjoy some relaxing evenings outdoors. If you are still carrying on with the 4th of July holiday weekend, these little cream cakes will add some more festivity to your table. 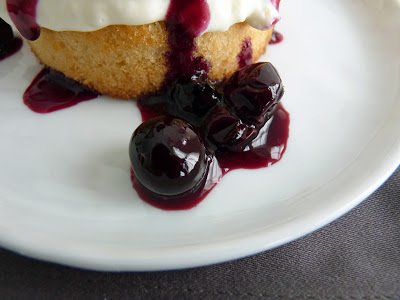 This is a basic white cake recipe from Dorie Greenspan that I’ve baked into cupcakes. The blueberries are simmered for just a few minutes to soften them and produce a nice flavorful compote. 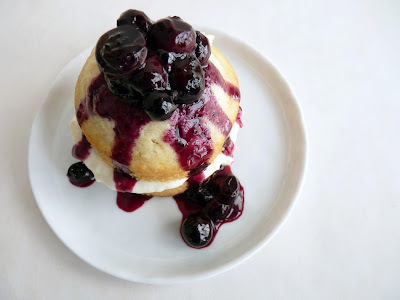 The cupcakes are split and filled with whipped cream and sauced with the blueberries. Easy peasy! - This is half the recipe for Dorie Greenspan’s Perfect Party Cake. It makes a dozen cupcakes. If you’d like to bake it as a 9” cake, bake it for 28 – 30 minutes. Double the recipe for a two layer cake. - Cake flour is important for a tender crumb. - Dorie’s recipe calls for lemon extract but I used vanilla. Preheat the oven to 350 degrees. Lightly grease a standard cupcake pan or line with cupcake papers. Whisk the milk and egg whites together in a separate bowl. Zest the lemon into the sugar and rub together with your fingers until the sugar is moist and fragrant with the lemon oil. Beat the butter with the sugar until light, about 3 minutes. Add the vanilla and mix. Add one-third of the flour mixture alternately with half the milk mixture, beginning and ending with the flour. Scrape down the bowl. Mix for about 2 minutes to combine thoroughly and aerate. Portion the batter into the cupcake pan and smooth the tops. Bake for 18 - 22 minutes or until cupcakes spring back to the touch or a tester inserted in the center comes out clean. Place on a wire rack and cool for about 5 minutes, then run a knife around the sides of the cakes and remove. Cool completely. For the blueberries, place them in a saucepan with the sugar and water. Simmer on low heat for 2 – 3 minutes. Dissolve 1 teaspoon cornstarch in 1 teaspoon cold water and mix into the blueberries. Stir and cook for another 2 – 3 minutes. Remove from heat, add the lemon juice and set aside to cool and thicken. Whisk the heavy cream, sugar and vanilla just until it forms soft peaks. Cut the cakes in half horizontally. 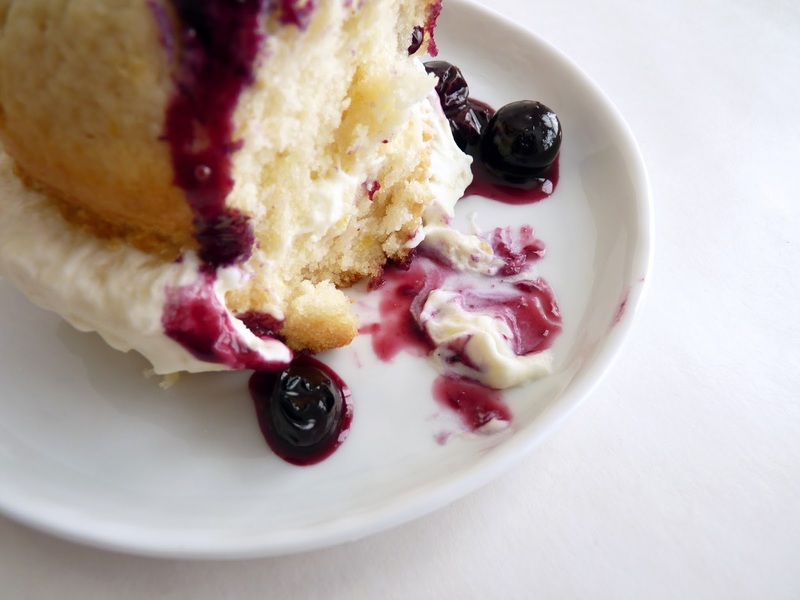 Layer a good dollop of cream and blueberry compote and serve.